Oh, we're loving them. We found a great place to purchase organic berries at conventional prices, either U-pick or convenient flats. (For local readers, the place is The Berry Patch on Old Melrose Road in Roseburg, OR.) I've stopped by each week for a few weeks to bring home flats of strawberries or raspberries. They will have strawberries all season, and various kinds of other berries all summer as well. My favorite way to preserve berries is to use a tweaked lacto-fermented preserves recipe in Nourishing Traditions. The original recipe is “Berry Preserves” on page 11. Using lacto-fermentation increases vitamins, enzymes and probiotics, making these preserves even better than the berries alone. What conventional jam can boast that? I will demonstrate these preserves as well as a few variations in the fermenting class. You'll need Pomona's Pectin — a wonderful, natural pectin that doesn't depend having a certain amount of sugar or even a certain type of sugar for setting up. You can use no sugar, low sugar, or natural sweeteners such as honey or stevia! This pectin can be used in fermented recipes (such as below), but also in cooked or freezer recipes. It is extremely versatile and easy to use. Click here for Pomona's free PDF of recipes and instructions — very handy, easy to read and a breeze to implement! This doesn't set up like your normal jam, but it does thicken. It spreads well on toast, pancakes, or as above, you can see we eat it by the spoonful with kefir. Delicious! This doesn't set up like your normal jam, but it does thicken. 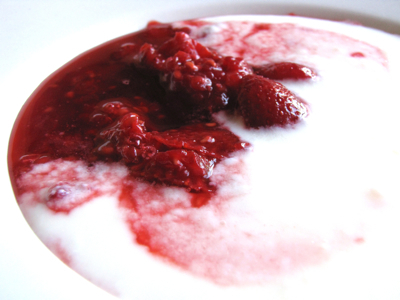 It spreads well on toast, pancakes, or as above, you can see we eat it by the spoonful with kefir. Delicious! Adapted from Nourishing Traditions. Makes 1 quart. Mash all ingredients together until all mixed and berries are crushed -- though I like to leave them a little chunky. Put in a clean, quart-sized glass jar, leaving the top 1-inch of the jar free. Cap tightly and ferment at room temperature for 2 days. If any mold or scum appears at the top, skim it off. Transfer to cold storage (refrigerator or cellar) for up to 2 months, or freeze for longer keeping. What are you making with summer berries? What is your favorite way to preserve them? Is there a dairy free way to make this? What about kombucha instead of WK? Amy — What I’d try is to use the peaches instead of the apricots in the apricot butter recipe on page 10 (do you have NT?) — also add Pomona’s Pectin same as above. The peaches will be fresh, not dried, and I’d just puree them or cook them down without adding additional water as you would if the fruit was dried. I hope this helps! I haven’t done it yet, but this is what I’m planning to do when figs, pears and peaches are in season here. I am also getting blackberries this weekend. I think I will try this preserve recipe with my blackberries . . . I’m so excited. Oh yes I almost forgot to say . . . “Thank you!! !” for your help. Amy — That’s a great idea for freezing the peaches. 🙂 Yes, add whey — about 1/4 cup per quart — and it would be best to let it sit overnight or even 2 days or so. Have fun! I am curious if you are able to can this once it is fermented? I would love to make a large batch and can them. Thanks, Wardee, for the great reminder! We get amazing boysenberries and blackberries from our farmbox that you need to eat or freeze immediately. This will certainly stretch out the summer berry joy a bit longer! Regina — My fermented blueberries have lasted longer than a year in the fridge. There should be no need to can unless you’re planning for multi-year storage. I *so* need to do this. Do you think there will be any problem if I use frozen berries which have thawed? I’ve already put up berries, but they’re frozen. Our berry season dwindled away last month. Texas in July is just WAY TOO HOT for berries to survive without burning up. Kristen — I think it will work fine. I froze a batch of raspberries the other day for the express purpose of testing this. I can’t imagine why not! I plan to thaw them and mix them up as usual. I’ll let you know if I run into anything when I do it, but otherwise I say go for it! Did you try using the frozen raspberries yet? Or will you be for this week’s lesson (lacto-fermentation)? Could I make this recipe into more like a thin fermented berry sauce by not adding the pectin? I was thinking of making something similar to this for pancakes…maybe freezing it in pint size containers….What do you think? I tried this last summer and ended up with a very alcoholic berry sauce which I threw out. I know this is a common problem with fermenting fruit. Any tips on avoiding this? Kim — That happens with time and excessive warmth, so the best way to avoid it is to stop fermentation before it goes too far and then eat the preserves within 2 weeks. YUM! I’ve tried fermenting my berries, but like Kim… end up with alcoholic berries. When I did them.. it wasn’t warm at all. The temps were cool and comfortable. But I didn’t use the pectin… is that needed? I’ve been fermenting berries for a while now, and my preserves always end up with a wine-like quality — that’s actually what I love about it. My first batch was indeed too strong though, so I’ve reduced the amount of sugar I use. Fermentation turns sugars into alcohol. I actually use honey instead of sugar and only a couple teaspoons for a quart of berries. This looks absolutely scrumptious! Looking forward to trying your recipe soon–thanks, Wardee. LOVE< LOVE LOVE your posts…..so very helpful. Have another question re: sour dough starter….not sure where to ask it. I've had a batch going since January, but can't seem to find enough recipies to use it. So far, husband not too happy with 'sour' taste or dryness. Any suggestions ? Just made a batch of the fermented raspberry jam…..question, mine is not jelled at all. Is this normal and will it jell with time or did I do something wrong? Used 3tsp just as recipe asked for. Is it possible to replace pectin and calcium water with another ingredient? Martine — You can leave it out. It is a way to gel or thicken the preserves. If you leave it out you’ll have more like mashed berries or a chunky syrup. I don’t know of a substitute without cooking. So freezing doesn’t mess with the beneficial ingredients? Miracle — Some might die, and more over time, but no, generally freezing is fine. Could I use beef gelatin to do the same work as the pectin? Alison — I don’t know as I’m not familiar with beef gelatin. Does it normally have to be cooked to activate it or how does it work? Just wondering if I can use whey from clabber cheese instead? Also, the lactofermented pickles I made last year from Nourishing Traditions all went mushy and yuck…has this ever happened to you? Miriam — Yes, you can use whey from clabber. And yes, I have had pickled go all mushy. In my case I was making them in a hot kitchen during the hot summer and the fermentation just went way too fast. If it is any consolation, pickles are the toughest to ferment, IMO. When they don’t work, they really don’t work. But thankfully more often than not they turn out okay. Also, many people prefer NOT to use whey in their pickles and like the results better. You might consider that. To keep your pickles from going mushy add a couple of grape or oak leaves to each quart. I have used oak leaves and it really works to keep those cukes or summer squash from getting soft. I had a problem with the NT version of pickles going soft and gross, but when I used the airlock this summer, they were nice and crisp. Don’t know if it was coincidental, but I’m going to be using the airlock from now on. Sorry, I just watched the free video and I see that I can use the whey from clabber cheese…however you suggest whey from yoghurt or kefir. I am now wondering if the flavor is very different and less palatable from clabber (mine is from goat milk)? Miriam — Clabber is a good choice; its whey should be mild for fruits. The only whey I wouldn’t use is whey from cheese where lipase is added (such as feta or quesco fresco), or anything other strong culture. I’m so glad you have made this! I was trying to find someone who had to tell me if I did it right. I followed the recipe in the book but cut it in half. The smell after two days was very strong (almost like nail polish remover, but not that bad). It looked and still looks a couple weeks later, perfectly preserved. Someone told me I probably did it right. My little boy liked it fine. Anyway, it looks like you use less salt than the Nourishing Traditions recipe, is that right? not sure if it’ll work, but i’ll try! Wah: AND i didn’t have enough whey! Can I ask if you dont use whey in your pickles what do you use to fement them? Lara — With pickles or most veggies, you don’t need to use whey at all. Salt is enough. I make a brine with 6 to 8 tablespoons of sea salt per 1/2 gallon of water and pour over. That is sufficient protection while the beneficial organisms get established to do the natural pickling. I just got a huge bag of organic blueberries that I would love to use in this recipe right away. My only problem is that I don’t have the recommended pectin. I will be getting it shipped from Azure Aug 8th but my berries won’t still be good… Anyway, would the recipe still work with Ball natural gel Fruit Pectin (it’s what I have in my cuboard currently, I got it from a canning party)? It says no sugar needed on it. Thanks for your help! I have some blackberries that have started to ferment in the fridge. Can I use these in your “on purpose” fermenting recipe? 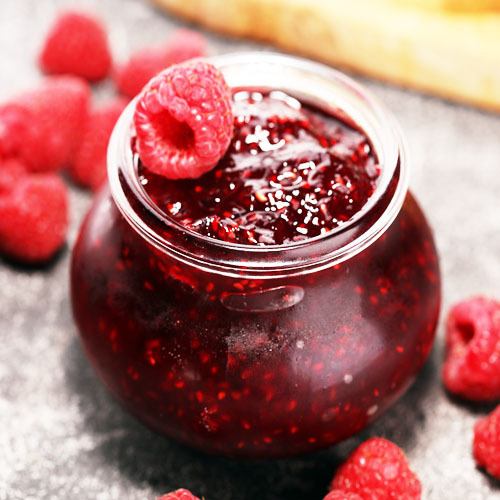 Would the berry sauce ferment, just as you have the recipe but with a bit of cooked cranberrry sauce added to thicken or would the cooked sauce keep the rest from fermenting properly? Yes! 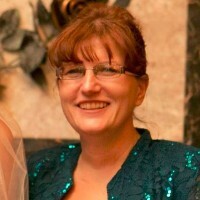 Wardee has the Lacto-Fermentation eBook from her eCourse on lacto-fermentation http://traditionalcookingschool.com/ecourse/fermentation-ebook. You might also consider the eCourse, especially if you are a visual learner. http://traditionalcookingschool.com/ecourse/membership. Wardee also has her Guide to Fermenting Foods. http://traditionalcookingschool.com/ecourse/books. Does the probiotic benefit remain even though frozen? I thought that’s why fridge is recommended over freezer. I have more freezer room than fridge, and would be happy if I could put probiotic preserves in the freezer vs. fridge. Please let me know! Hi! I was wondering if I can use blue elderberries to make medicinal use elderberry syrup? We have the blue ones growing wild everywhere. Thanks so much!